Once you get testing suite up and running you are interested in running your tests regularly. If you ensure that tests are running on every code change or at least once a day you can be sure that no regression is introduced. This allows to keep you system stable. But developers are not so passionate about running all tests manually, they also can forget to execute tests before pushing code to production… The solution is simple, test execution should be automated. Instead of running them locally it is better to have dedicated server responsible for running tests for a team. This way we can ensure that everyone’s tests executed, which commit made a regression in codebase, and that we can deploy only once tests pass. There are many Continuous Integration Servers out there. We will try to list basic steps to setup Codeception tests with them. If your CI system is not mentioned, you can get the idea by analogy. Please also help us to extend this guide by adding instructions for different CIs. Jenkins is one of the most popular open-source solution on market. It is easy to setup and is easy to customize by applying various plugins. Green Balls - to display success results in green. AnsiColor - to show colorized console output. At first we need to create build project. Depending on your needs you can set up periodical build or trigger build once the change is pushed to GitHub (you will need GitHub plugin for that). But we don’t want to analyze console output for each failing build. 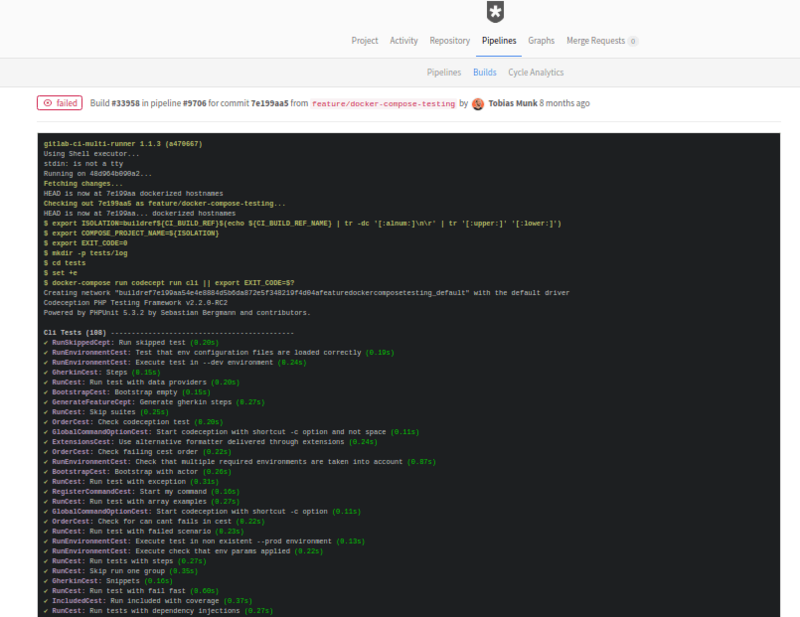 Especially If Jenkins can collect and display the results inside its web UI. Codeception can export its results using JUnit XML format. To generate XML report on each build we will need to append --xml option to Codeception execution command. Codeception will print result.xml file containing information about test status with steps and stack traces for failing tests. and ask Jenkins to collect resulted XML. This can be done as part of Post-build actions. Let’s add Publish xUnit test result report action and configure it to use with PHPUnit reports. Now we should specify path to PHPUnit style XML reports. In case of standard Codeception setup we should specify tests/_output/*.xml as a pattern for matching resulted XMLs. Now we save the project and rebuild it. 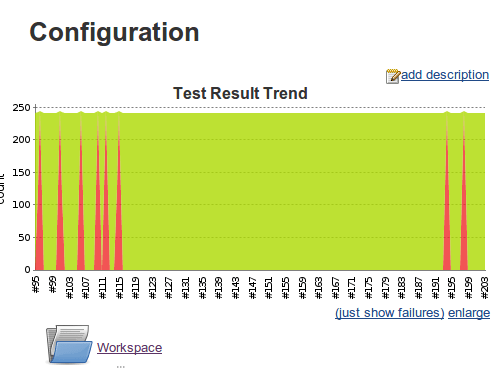 Now for all builds we will see results trend graph that shows us percentage of passing and failing tests. We also will see a Latest Test Result link which will lead to to the page where all executed tests and their stats listed in a table. 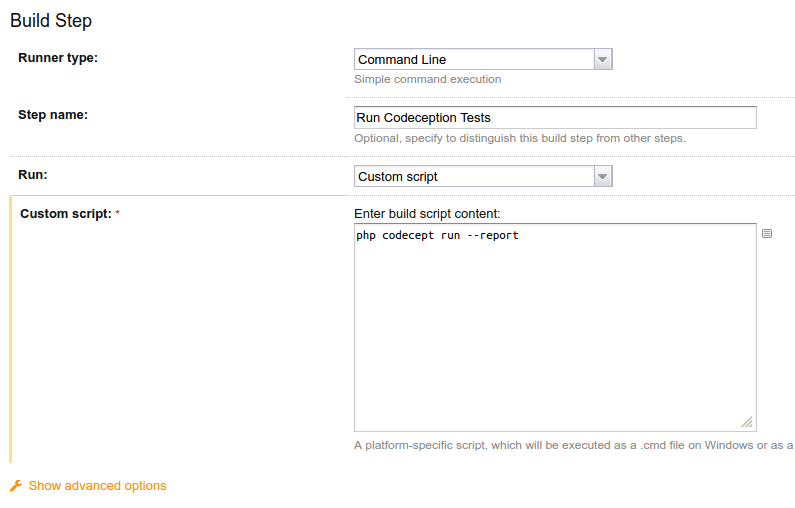 To get more details on steps executed you can generate HTML report and use Jenkins to display them. Now we need HTML Publisher plugin configured to display generated HTML files. It should be added as post-build action similar way we did it for XML reports. 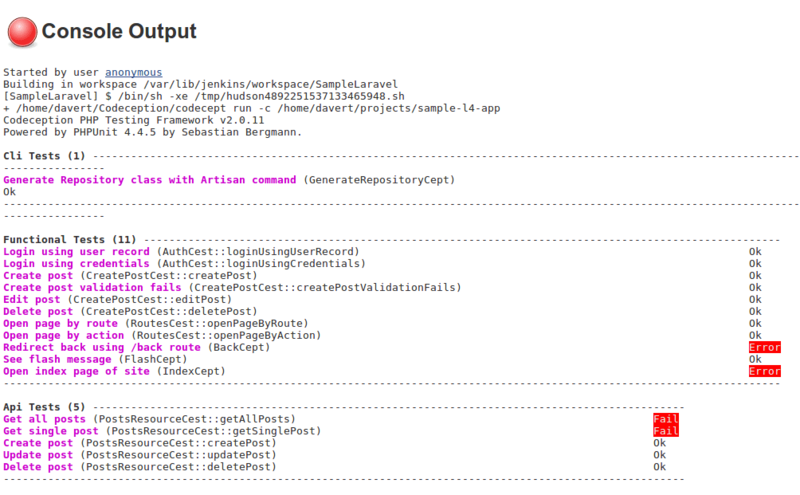 Jenkins should locate report.html at tests/_output/. 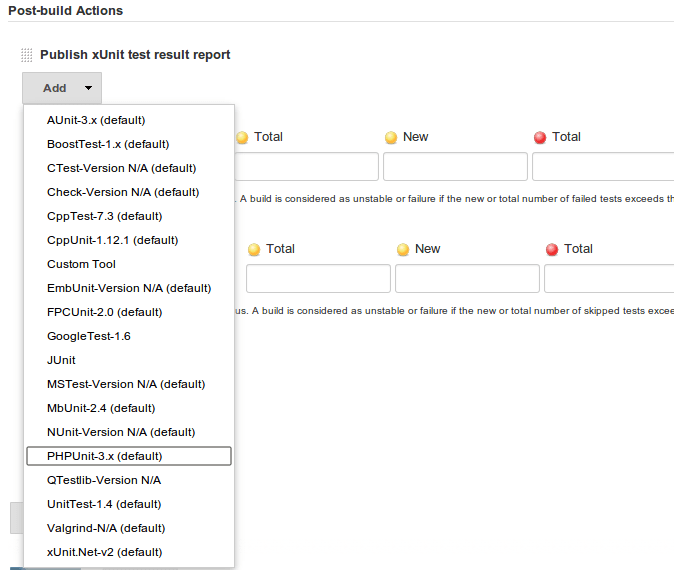 Now Jenkins will display HTML reports for each build. As an alternative you can use 3rd-party TeamCity extension for better reporting. More details on configuration can be learned from Codeception’s .travis.yml. Travis doesn’t provide visualization for XML or HTML reports so you can’t view reports in format any different than console output. 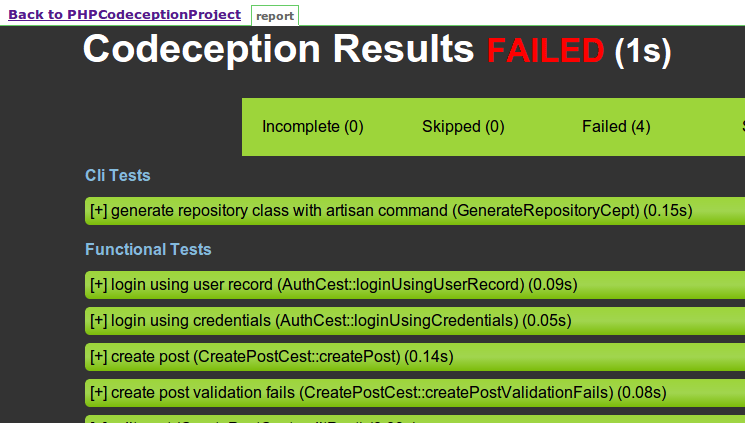 However, Codeception produces nice console output with detailed error reports. For acceptance testing you can use codeception/codeception docker image as base. It is highly recommended to use Continuous Integration system in development. 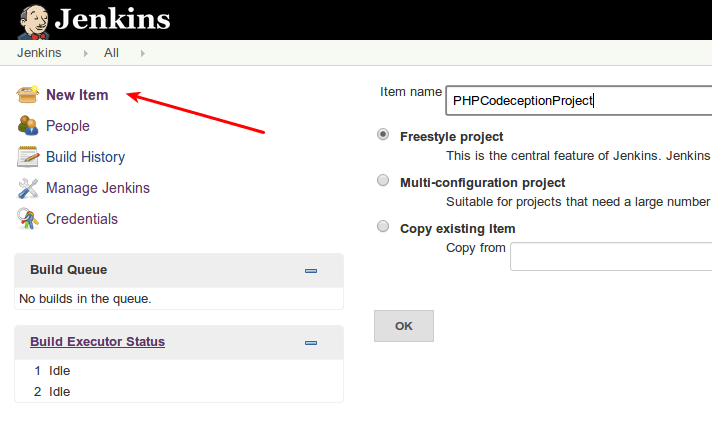 Codeception is easy to install and run in any CI systems. However, each of them has their differences you should take into account. You can use different reporters to provide output in format expected by CI system.